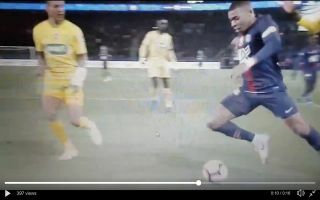 PSG superstar Kylian Mbappe has sparked controversy this evening after he quite literally jumped at the chance to try and win a penalty against Nantes. The French superstar looked as though he got the better of Nantes defender Edgar Ié with a brilliant piece of skill, but the youngster lost his balance soon after and before the ball ran out of play the World Cup winner tumbled to the floor despite the fact that there was no contact from Ié. The star’s miserable attempt at a dive also put him on the receiving end of a knee to face as his dive caused one of Nantes’ players to trip over him. Some fans could call for Mbappe to face punishment for his actions.